When I was in college, I was blessed to have a roommate named Socrates. Both his parents were Greek. They were a great family. They took me in and treated me like one of their own. Mr. Demet was a great teacher, and fortunately for me, my very own ‘Rich Dad’ type teacher. He taught me right alongside Socrates. I could not have gotten a better education. As a matter of fact, the education I got from him has been worth more to me than the education I got from college. After I graduated I got my first corporate nine-to-five job. Socrates and I again became roommates. Very good deal for me! We bought our first property together. Now we had gone out to find a property, and being young college graduates living at the beach, we decided to buy a little townhome a few blocks from the ocean. It was great—of course it was going to be a chick magnet. We were going to live the life. But before the day was out Socrates’ dad set us straight. We got out of that deal, thank goodness, because it would have been a losing deal. He then took us by the hand and showed us what to do. Instead we bought a nice little property in Virginia Beach—478 Leslie Terrace—ten minutes from the beach, and two minutes from where I worked. While Soc’s dad cosigned the second mortgage and showed us how to do everything, he did not give us any money, though. Instead of giving us a meal of trout and salmon, he taught us how to fish. My first day of work, I recall dreading “having to do this for the next 40 years.” I liked the people but I hated the corporate nine-to-five gig—being stuck in an office with the beach so close and beautiful weather and gorgeous girls. But I had to make money, right? It was a four-bedroom, two-bathroom home. We bought it from a guy in the Navy. We assumed his first mortgaged, refinanced his second, and gave him a note and a mortgage for the third—which was his equity portion of the property after the first and second mortgages. Socrates and I lived there, and we rented the other rooms out. Essentially we were able to live for about $50 a month, because the other guys’ rent covered our mortgage payment. I had only about $3,000 in the deal altogether. I remember Soc’s dad telling us, while we stood at the dock of one of his beach homes, “If you boys do what I show you, you will not have to work for anybody else past the age of 35.” And thankfully for me, he was a real life example of success, someone who was actually investing in real estate and making money doing it. I learned something very profound during this time. I learned I was not built to be sitting behind a desk in a corporate job, Monday through Friday, nine to five, for 40 years; I knew I had to do something about it. But then guess what happened. I found the girl of my dreams, got married, and had children. At that point, Mr. Demet did not think it would be a good idea for Soc and I to try to hang on to the home together. Virginia real estate rules were complicated, and with me being married and him not, we decided Socrates would buy me out. I got $8,000 out of the deal. Remember I put $3,000 in, and got $8,000 out in about a two-year time frame. Not a bad return! A 266% return. I knew I would never be able to do that in the corporate world. My new bride, Susan, and I bought our first house together. It was nice, new, just one mile from the ocean and only $85,000. Today that house is worth $350,000. Just a like a lot of other smart people I should have held onto it when we moved to Pittsburgh. But we needed the money. I know, you think I am crazy. Why would I move from the beach to Pittsburgh? Well, my wife was from Pittsburgh, and I felt like I needed a new beginning to pursue my dreams and make my way in the world. I began focusing on my professional career—Computers in Banking. I worked so much at one point I actually had a cot in my cube. My daughter was not even three years old and Susan was pregnant with our son, Andrew. I got called into my boss’s office and was told I had earned a $500 bonus for all my effort. What a slap in the face! That was just about half a week’s pay and I had worked extra hours that much dozens of times over. I learned a hard lesson. First of all, no one else was doing what I was doing, yet they were making the same amount of money I was. Second of all, I was just a number. Other than the people around me, no one who really mattered knew who I was or what I was doing. I was wasting my time. I knew I had to do something else. Fortunately I had a valuable commodity… I had knowledge of a software system that allowed me to move to another bank in Pittsburgh. I had raised my salary by quite a bit from moving from Virginia Beach to Pittsburgh, and in short order, I increased it again by more than 50% in about an 18-month timeframe. But I was not happy. My spirit was dying. I felt like I had lost my freedom, and I did not like being cooped up indoors all day. I am an outside person. Suddenly I was 35 years old. It had been ten years since I had sold my portion of that property to Socrates. I remembered what his dad told me. I was now the age he had said when I would not need to work for anybody else. I was maturing enough to realize I was living according to what the world expected of me—not what I wanted for myself. I never lost my desire to own investment real estate and since I was getting up at 5:00 in the morning to beat traffic and get a parking spot and be at work by 6:30, I got to see a lot of Carlton Sheets. I could almost recite his infomercial line by line. I finally bit the bullet and bought his course. I studied it just like a school textbook. Then within six months I entered into a contract to buy my first two properties—a pair of fourplexes in a borough called Westview, just right on the city line. It was my first solo foray into real estate. I was back in the saddle and a new chapter in my life had begun. The lessons I learned from Mr. Demet were beginning to bear fruit and this is what I want to share with you. I believe with undying faith in the American Dream. It is alive and well for people including those who are from foreign lands like Mr. Demet. I further believe that investing in Real Estate is the best path to realizing the American Dream. He was a real life role model, showing me it absolutely could be done. I know a lot of you guys reading this do not have that, but I hope you will use me as that example. But I don’t just want you to be like me… I want you to be better than me. I am going to show you everything I did to accumulate a portfolio of 250 units in about five years. I started off with a pair of fourplexes. I believe in real estate. I believe in the American dream. Yes, you can do it! In today’s economy it is more possible than ever. Prices are still relatively low, according to historical averages, and interest rates are as low as they have been in 50 years. What more could you possibly ask for? My promise is to teach you what I have learned, and not just how, but why certain techniques work the way they do. This is something I found missing in a lot of courses I have taken and books I have read. 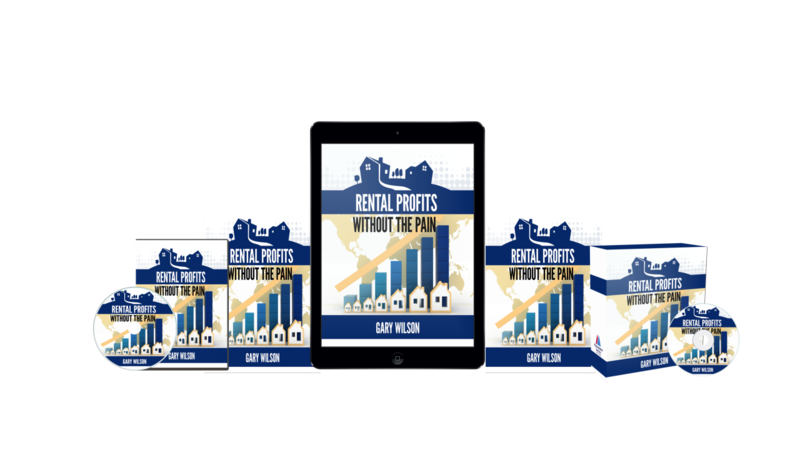 I promise that if you follow the suggestions in this training program that you will be Real Estate Investing for Rental Profits the Right Way and Without the Pain that less informed investors experience! By creating this system and following it to a T! Period! I developed procedure and processes and systematized them so that I could almost invest in rentals on autopilot. There are basic processes involved in successfully investing in rentals. When you follow this systematized approach that I am giving you, you will be able to acquire Rental Properties Without The Pain! If you KNOW you were born to be independent, born to be FREE!, and you want to be RICH!, then this is for you! Locating properties—areas to target; areas to avoid; the difference between high income, median income, and low income areas, and a category I call “somewhere in the middle. How to find the money to make your investment purchase. How to leverage your money with savings, CD’s, Mutual Funds, Stocks, Bonds, and Real Estate. Types of properties, as you know, consist of single-family homes, small multi-units, and five-units and more. Types of property owners to look for. Learn the different resources for locating rental properties to purchase. Discover which type of neighborhoods are best for investing in rentals. Learn the financial calculations necessary for determining a profitable investment. Learn how to use Proformas and a blended-rate calculator which allows you to determine how a particular real estate investment measures up to other forms of investment like stocks, bonds, and mutual funds. Learn how to benefit from and utilize The Property Rehabilitation Analysis Form. Rehab Advise- Learn what to rehab, how much you should spend and how far to go. How to properly negotiate your deal. Learn how to calculate the MAO(Maximum Allowable Offer). Learn the difference between buying turnkey versus buying low, renovating, and refinancing. Title Insurance, closing company, home owners insurance, fire insurance, A, B, and C form coverage, utilities, property management, and more. Everything you need to have in place for a smooth closing. What happens if something doesn’t go exactly right or you change your mind about holding rental properties? Whether you rent, sell (flip), or lease option, there is always more than one way to make money. Still not convinced? Think about the cost of not using this system. How much money are you leaving on the table by continuing to do what you’ve already been doing? Believe me, you don’t want to learn the hard way. If I can save you even one mistake that would cost you $5,000 and countless hours of labor, would it be worth the investment? I think you would agree, the answer is obvious.